30% of Singaporeans have high blood pressure. The good news is it is a condition that can be controlled and improved with lifestyle and diet changes. A key component to managing your blood pressure is to measure it regularly. For that, you need a blood pressure monitor for your home or to bring with you on the go. We have searched high and low for the best ones available in Singapore. Here they are, categorized by their prices! We hope you’ll find one suitable for you by the end of the article. If you want a value-for-money option – get the Blood Pressure Monitor For Wrist ($22) available on Carousell! Otherwise, here are the other best blood pressure monitors in Singapore today! Powered by OMRON’s Intellisense technology, every blood pressure reading is an accurate, quick and comfortable process. Its design is sleek and futuristic-looking. Who says a blood pressure monitor has to be dull-looking? The OMRON HEM-7600T is lightweight and portable which makes it convenient for you to bring it around. The results can also be synced to the OMRON app, available on both the App Store and Google Play. The app is intuitive and easy to use. You can view your whole history of blood pressure results on it. This feature is perfect if you would like to monitor the results of your loved one. 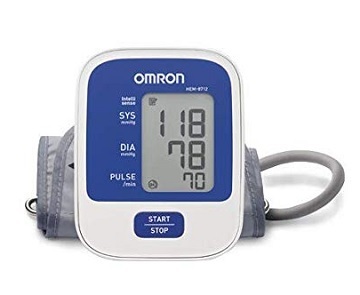 With the longest warranty period of 5 years among blood pressure monitor brands, you can be assured of quality whenever you buy an OMRON product. The high-tech OMRON HEM-7600T is available on Lazada. Get the best for your health monitoring! The Omron JPN1 is another top quality blood pressure monitor under the OMRON brand. OMRON’s commitment to precision is evidenced by the high accuracy and speed of each blood pressure test you take with the JPN1. This monitor is also elderly-friendly as it is very easy to operate. The START/STOP and LCD display are large and easy to press and read even with poor vision. There is also a blood pressure indicator on the LCD screen which helps serve as a guide as to whether the levels recorded are good or bad. For a reliable and elderly-friendly blood pressure monitor, check out the OMRON JPN1 on Lazada! Accurate blood pressure readings are essential for accurate tracking of your health. The Braun BP6200 offers accuracy that is approved the European Society for Hypertension. You can have a peace of mind that readings taken are highly accurate. Also, it comes with a small and large cuff size. That is perfect especially if you need to share the monitor. You will be able to customize the cuff size to your arm for maximum comfort. With the gentle inflation of the cuff, the entire blood pressure taking process will be much more comfortable. 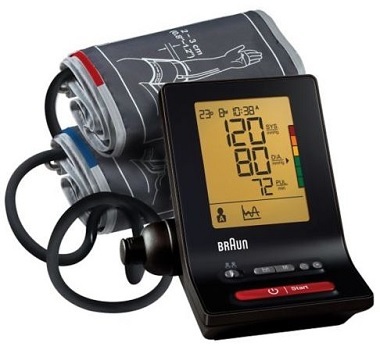 Braun BP6200 ExactFit 5 Blood Pressure Monitor is available on Lazada. Click here to find out more! Accurate readings are guaranteed with the OSIM uCheck 200. It uses the oscillometric technique to get precise results every single time. With memory storage of up to 99 readings, you’ll also be able to track the history of your results. The device is not overly complicated to operate like some others. Right out of the box, using it will be a straightforward and intuitive process. The large LCD screen makes it easy to read the results at one single glance. 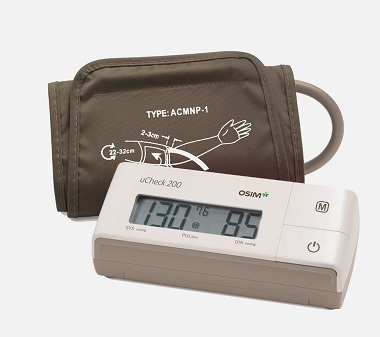 The OSIM uCheck 200 Blood Pressure Monitor retails on Lazada. Get it now! Taking an accurate reading of your blood pressure has never been so easy. 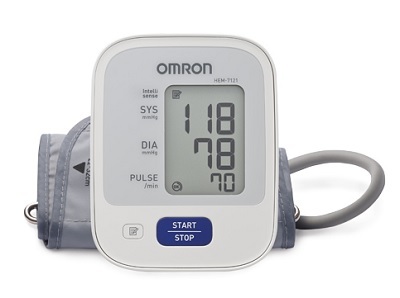 The OMRON HEM-8712 Blood Pressure Monitor has sensors in place to help guide you through all the steps. It gives you a signal when you have correctly positioned the cuff on your arm. While taking the blood pressure reading, it has sensors that will detect body movement that causes inaccuracies. Also, it has an alert which is useful if you have hypertension. A signal will blink on the screen if your systolic or diastolic reading is above 135 or 85 mg respectively. This could be crucial for the early detection of any health issue. OMRON HEM-8712 is not just a blood pressure monitor. It is a partner in helping you take care of your health. You can get it from Lazada today! If you want the high-quality and accuracy that OMRON devices are known for at a more affordable price, the HEM-7130 Blood Pressure Monitor is the answer. With a more simplistic design that has fewer bells and whistles, this is most value-for-money OMROM blood pressure monitor. Every essential aspect of professional blood pressure reading is present. It can detect body movements during the test, tell you whether the cuff is attached correctly, detect irregular heartbeats and even store up to 60 readings in its memory. Get the precision and quality of an OMRON HEM-7130 on Lazada. Click here to check out this deal! 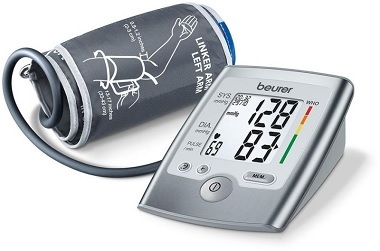 There is a whole list of features that make us want to recommend the Beurer BM35 Blood Pressure Monitor. It has a large and clear display that makes it very easy to read. Operating it is simple, just attach the cuff to your arm, start it up and within a minute or two the process is complete. You can also monitor your average blood pressure results to see a more holistic picture. If you are using it wrong, it will also signal you to ensure every reading is done professionally. As a home user, the Beurer BM35 is a fantastic choice. Buy it on Lazada today! Besides being covered by a 5-year warranty, the Rossmax CF155 Blood Pressure Monitor also offers free lifetime calibration of the device. When you buy it, it feels like you are buying it for life. Its precise accuracy is helped by the use of Real Fuzzy Technology. Also, it has all the necessary features like movement detection, memory storage, detection of irregular heartbeat and hypertension. 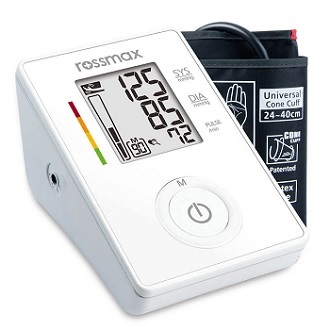 The Rossmax CF155 Blood Pressure Monitor is a quality product that easily outperforms its price tag. You can check it out on Lazada by clicking here! MedCheck is a Singaporean brand that thoroughly understands the needs of not only the primary user but their family as well. It comes with a system that can send a message to your phone every time a blood pressure test is taken. This is perfect if you are buying it for your ageing parents. That way you can easily check on their blood pressure every single time seamlessly. It can also be connected to the MedCheck app that syncs automatically via Bluetooth. On the app, you can view past results, averages and even set reminders on what time to take tests. Take care of your loved ones with the thoughtful MedCheck Smart Blood Pressure Monitor. Check out what satisfied customers are saying about it on Lazada by clicking here! Some people find it more comfortable and convenient to use a wrist instead of arm blood pressure monitor. 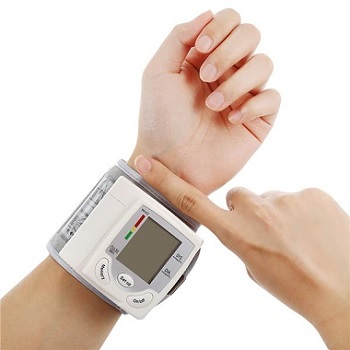 If so, definitely give this wrist blood pressure monitor a try. It is a portable device, weighing less than 150g, that can be easily brought around from home to work and even for travel. Its measurements are highly accurate – comparable to more other blood pressure monitors that cost more than twice or three times its price. The process of using it is straightforward which makes it great even for older folks. Additionally, the seller delivers the item fast which is really convenient. If you want a value-for-money option, this wrist blood pressure monitor is a perfect choice. 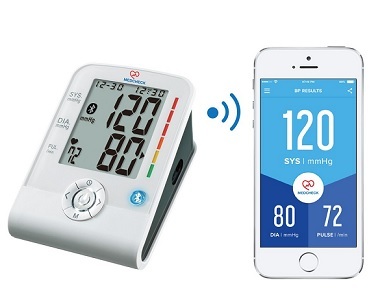 The affordable blood pressure monitor is available on Carousell! Check it out before stocks run out! 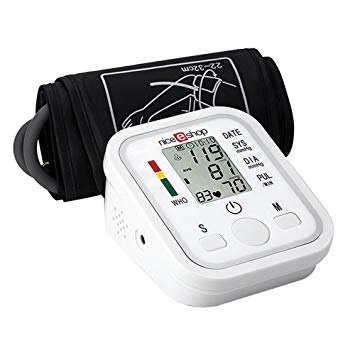 It is rare to find a good quality blood pressure monitor below the $50 price point. That is until we found the NiceEshop blood pressure monitor. It costs only $18. That is less than one-tenth the price of the top-range models. So how does its accuracy hold up compared to illustrious brands like OMRON? According to reviews, the variation is around 5 mmHg. For its price point, that isn’t too bad. It is still accurate enough to highlight when blood pressure is too high. Just add a buffer of 5 mmHg to the results to be safe. For its price point, this NiceEshop blood pressure monitor is definitely an excellent buy. You can get it on Lazada now! Are you still unsure about which blood pressure monitor to go for? Here are our TOP recommendations again! If you choose one of them, you definitely won’t be disappointed. Advanced and complicated-looking blood pressure monitors may not be suitable for the elderly. It may intimidate them and make them lose interest in maintaining a schedule for measuring their blood pressure levels. Also, a large and clear LCD screen is essential especially for users with poorer eyesight. Buttons should also be clearly labelled. The device should ideally be a one or two button operation. Simplicity is key when buying a device for the older generation. The most critical aspect is accuracy. That is why we recommend you to get a blood pressure monitor by an established brand. The most popular and reputable brand is OMRON, known for their precision and quality. Most blood pressure monitors measure through arm cuffs. If you are not comfortable with that, get one which measures through your wrist. Arm monitors are generally more accurate. However, to attach the cuff to your bare arm does take about a minute. For precision go for an arm cuff. For convenience, a wrist cuff monitor would be ideal. Bluetooth or WiFi connectivity allows you to sync data, reports and results to an app. By uploading each result, you can monitor your blood pressure history to spot any anomaly or even improvements. As the results can be accessed online, you will be able to track the readings of your family members for peace of mind. You can also show the history of the results to your family doctor for him or her to understand your medical situation better. Without this connectivity and reporting, you may need to rely on the internal memory of your blood pressure monitor. Usually, it can only store around 60 to 100 readings, which may not be sufficient. Alternatively, you can also record the readings down manually each time. Do you need to bring the blood pressure monitor around? If so, look out for one which is light and portable. Most of the monitors that we have recommended are pretty compact. 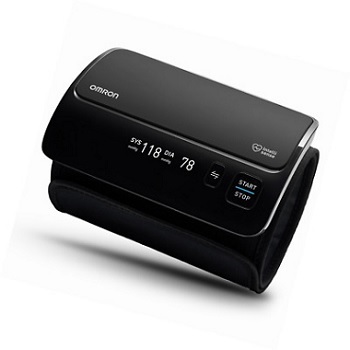 For a sleek and portable one, definitely check out the OMRON HEM-7600T. OMRON offers a 5-year warranty period which is probably the highest among all the other brands. OMRON’s service centre is at Alexandra Road. When you divide the cost of an OMRON product over 5-years, it is actually very reasonable. This commitment to quality and also warranty justifies their premium pricing. Other brands usually offer a 1 to 2 year warranty period. Those below $50 typically provide a few months to no warranty. 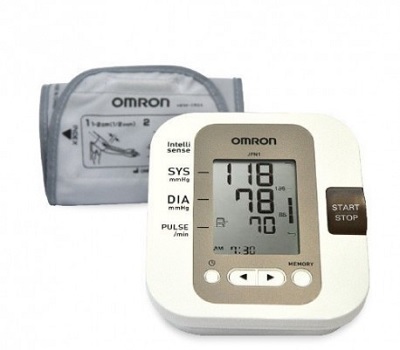 So if you need a reliable blood pressure monitor, it is better to get one from OMRON. How to take your blood pressure accurately? 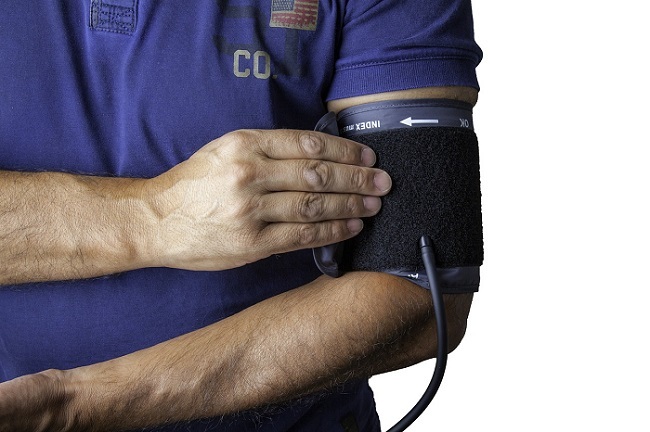 For blood pressure readings to be accurate, here are a couple of tips you should follow. Try not to measure your blood pressure immediately after waking up. Give your body around 15 to 30 minutes to adjust to its normal blood pressure for more accurate results. Do not eat, drink, smoke or exercise at least 30 minutes before taking your measurement. Sit upright in a comfortable position. Relax your feet, arms and body. Preferably, wait about 5 to 10 minutes before starting to take your blood pressure. It is recommended to use the same arm each time. Your arm should be resting in a comfortable position that is approximately level to where your heart is. Make sure the cuff is touching your skin. If your sleeves are in the way, roll them up. Measuring through cloth will create inaccurate results. It is recommended to take 2 readings each time. This is to help check the accuracy of the readings. The two results should be within a single digit difference of each other. Haven’t made up your mind? Check out these popular models and they may just be the right one for you!